This exceptional and individually architect designed home offers a stunning quarter-acre plot and is situated across the road from the local boat club. The property is beautifully presented throughout and includes three reception rooms for flexible living and a large kitchen diner with four bedrooms, en-suite and family bathroom on the first floor. For large families the extensive driveway is ideal and the tandem double garage provides secure parking. A rare opportunity indeed. No upward chain. General Information - Normanton on Soar is a highly regarded and popular village situated approximately three miles north of Loughborough. Surrounded by scenic countryside the village offers amenities to include a village hall, Primary School and Public house. In addition Normanton is well situated for travel to local centre's of employment in Loughbough, Leicester, Nottingham and the East Midlands International Airport. Travel networks available include the A46, A6, M1/M69 and A/M42 with trains available from both Loughborough, The Parkway and Leicester to London, St Pancras. Epc Rating - An EPC assessment has been carried out on this property with the resulting rating D. For a copy of the full report visit www.EPCRegister.com using the postcode to search for the property. Frontage - The property is set well back from the Main Street behind a deep verge, with decorative walling to the front boundary and wide entrance way leading to a substantial block-paved forecourt parking area, with raised water feature and bedding plants and lighting. The driveway continues to the left-hand side of the property leading to the detached tandem garage. There is an outside light adjacent to the uPVC front entrance door plus all fascias, boards and guttering all replaced last year. Ground Floor Wc - 1.9m x 1.19m (6'3" x 3'11") - Attractively re-fitted with a two-piece modern suite comprising a contemporary-style washbasin with mixer tap and close-coupled WC with dual flush, ? height tiling and contrasting floor tiling, central heating radiator, ceiling light point and obscure uPVC double-glazed window to the side elevation. Front Lounge - 4.83m x 3.55m (15'10" x 11'8") - A spacious and neutrally decorated reception room with wide uPVC double-glazed window to the front elevation, coved ceiling with light point and double radiator, plentiful power points and contemporary style recessed fireplace to the side wall. Rear Sitting Room - 5.11m max x 3.04m max (16'9" max x 10'0" max) - Accessed from the kitchen's side elevation, this good sized sitting room is ideal as a daytime living space opening to the rear garden and also ideal for young families perhaps wanting a children's playroom adjacent to the kitchen or a less formal living room. Having two ceiling light points, coving, double panelled radiator and contemporary feature fireplace to the side wall, plentiful power points and TV point and uPVC double-glazed patio doors access the rear garden. 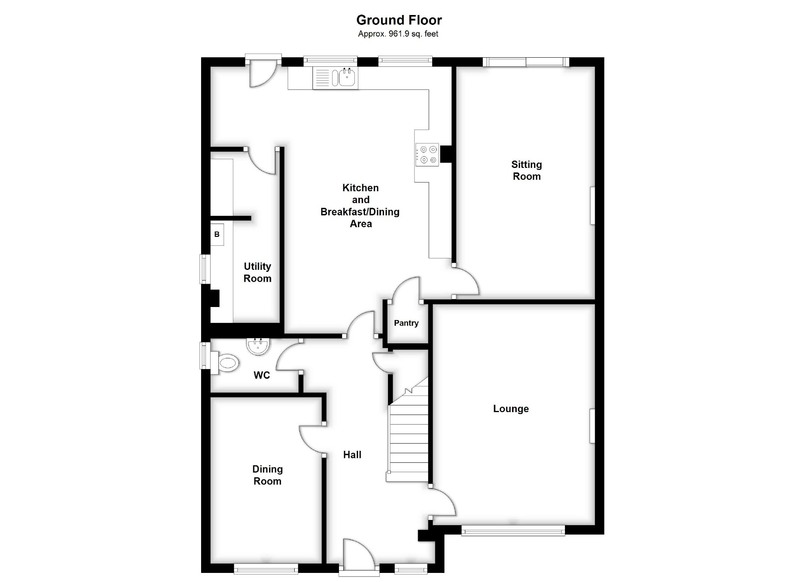 Fitted Kitchen & Breakfast/Dining Room - 5.87m x 5.3m max (19'3" x 17'5" max) - Attractively re-fitted with a modern 'shaker-style' set of units to base and eye-level with ample work-surfaces for food preparation, 1 & ? bowl sink with drainer and mixer tap plus adjacent boiler tap with additional water filter facility. 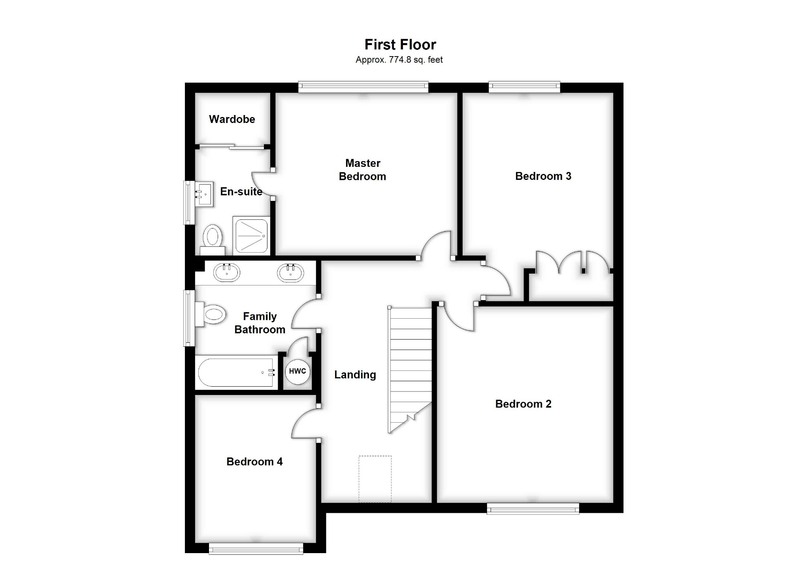 Utility Room - 3.96m x 1.54m (13'0" x 5'1") - Split into two sections with plentiful storage space and having additional 1 & ? bowl stainless sink with drainer and mixer tap, space and plumbing for appliances, ample power points, double radiator, wall-mounted Ideal Logic central heating boiler (the boiler was installed one year ago and there are six years remaining on the Warranty), ceiling light points, consumer unit and obscure uPVC double-glazed window to the side elevation. Part-Galleried Landing - Overlooking the stairwell, with a spindle balustrade matching the staircase itself, central heating radiator and double-glazed skylight window with fitted blinds to the property's front elevation. Ornate coving with ceiling light point, loft access hatch which leads to the loft space above which is fully boarded for storage and has lighting and power and is accessed via a built-in loft ladder and the roof space being of traditional construction which may allow potential conversion (subject to any consents) , power points and doors off to all four bedrooms and the family bathroom. En-Suite Shower Room - 2.17m x 1.5m (7'1" x 4'11") - With built-in wardrobe/storage and having a three-piece modern suite comprising fully-tiled shower cubicle with electric shower unit, close-coupled WC with dual flush and vanity washbasin with storage beneath and monobloc mixer, full-height tiling, white-finish towel radiator, ceiling light point and obscure uPVC double-glazed window to the rear elevation. Bedroom Two - 3.56m x 3.91m (11'8" x 12'10") - With a double radiator, ceiling light point and uPVC double-glaze dormer window to the front elevation. Bedroom Three - 3.99m x 3.08m (13'1" x 10'1") - Having a three-door wardrobe and matching three drawer chest, vanity unit with knee hole and bedside cabinets (available subject to separate negotiation), ceiling light point and double radiator with uPVC double-glazed dormer window overlooking the rear garden. Family Bathroom - 2.42m x 2.57m (7'11" x 8'5") - With tiled floor and under-floor heating with thermostatic controller and incorporating a built-in airing cupboard with pre-lagged water cylinder and linen storage shelves above, the bathroom itself has a four-piece suite comprising a panelled bath with mixer, close-coupled WC with dual flush and substantial vanity unit with plentiful drawer and cupboard space beneath, 'His & Hers' washbasins and mirror with lighting. Full-height wall tiling, LED double-lights, obscure uPVC double-glazed window to the side elevation, chrome-finish towel radiator and telephone point. Bedroom Four - 3.03m x 2.44m (9'11" x 8'0") - With ceiling light points, central heating radiator and uPVC double-glazed window to the front elevation. Rear Garden - The property sits on an impressive overall plot of just under ? of an acre, the rear gardens are attractively landscaped with a sizable patio having three water taps and outside lighting points plus covered sockets situated immediately adjacent to the rear of the property providing a good mix of sun and shade throughout the day, matching paving leads to a further patio central to the impressive lawn space. With further paving leading to the foot of the plot to a concealed storage area with a good-sized timber shed and additional storage garage, plus a third patio at the very foot of the plot. There are bedding plants to border and quality fencing with concrete posts and soil boards. Tandem Double Garage - 11.1m x 2.51m (36'5" x 8'3") - With electrically operated section up-and-over door to front, additional uPVC double-glazed door and windows, with internal lighting and power plus covered power point to the side of the garage. With useful storage space within the roof beams and toilet to the rear, adjacent to which is workshop area with workbench and power points. Outbuildings - Having two additional timber storage sheds and the storage garage which has wide double access doors and internal measurements of 3.27m x 2.6m having glazed side windows and being of concrete construction with galvanised roof and double access doors.